Molly Goodson was scoping out wedding spots in Sonoma when her BlackBerry was bombarded with a flurry of e-mails. She got back to her hotel room only to find that Lindsay Lohan had been slapped with a DUI. Obviously, she had to blog about it. "My BlackBerry has a short leash on me," Goodson said, laughing. "I'm that rude person at dinner who's always checking it." As long as Reese Witherspoon not-so-secretly dates Jake Gyllenhaal, Victoria and David Beckham jet set around the globe, and spoiled celebutantes pop into rehab, Goodson's job is never done. 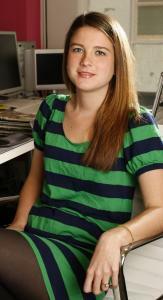 The Newton native, 25, is the editor of celebrity gossip blog PopSugar, based in San Francisco. She scours the Web, chats with industry insiders, and combs through photos daily, looking for juicy tidbits about Paris Hilton, Hayden Panettiere, and other members of the celebrity beau monde. And because of her Boston roots, she always pays special attention to local stars like Ben Affleck and Matt Damon. "The best is when I get to post a picture of Ben Affleck in a Red Sox hat," Goodson said, in a recent phone interview. "If you told me 10 years ago that I would write about celebrities for a living, I'd have hoped you were telling the truth." Goodson is a rising star among the ranks of celebrity bloggers, who are beating gossip staples like the New York Post's Page Six to the salacious punch with their up-to-the-minute websites like DListed, The Fug Girls, and Egotastic. And the Sugar network - which, in addition to PopSugar also includes CasaSugar, a blog about hip home decor, and PetSugar, a blog for pet lovers - gets 50 million page views monthly, according to Rebecca Gruber, director of public relations for Sugar Inc. Ten years ago, Goodson was 15, devouring movies and Star magazines in her Newton bedroom. Her walls were covered with magazine collages of Brad Pitt, leftovers from an intense middle school crush. Future "Office" funnymen John Krasinski and B.J. Novak were seniors at Newton South High School when she was a freshman. Though she was fascinated by Hollywood, it was a very far away place. "Molly always knew what was cool before anyone else," Goodson's childhood friend Lizzie Pollock said. "She was the first to watch MTV, and she subscribed to Entertainment Weekly and read it avidly." Pollock, who now lives in Los Angeles, remembered how their friends went through a Backstreet Boys phase that had plenty of choreographed dancing. Then, there was the blue, strappy Calvin Klein dress Goodson wore to her senior prom - the same one Gwyneth Paltrow wore to the Screen Actors Guild awards in 2000. Despite her love of all things celebrity, Goodson didn't make it a career goal. She wrote for the school newspaper and studied politics at Pomona College in Claremont, Calif. She envisioned a future in politics. "I always thought I would work on the Hill in D.C.," she said. The summer after her junior year in college Goodson worked for Senator Ted Kennedy in Washington, and after graduating in 2004, she worked for the Democratic National Convention in Boston and then for a nonprofit in New York City. Around that time, she began writing pieces for Jossip.com, a media blog based in New York. Goodson soon became friends with Jossip's founder, David Hauslaib, and when he realized her knack for starlet news, he asked her to start a celebrity blog, MollyGood, in early 2006. "Of course, that was a dream come true," she said. "I had to find my voice. On slow days, I'd say to myself, 'My God, Britney, please just leave the house.' "
Goodson made a name for herself in the blogging community, and when her fiance, Kjell Jorgenson, moved to San Francisco to start a medical residency, it seemed the right time for her to make the leap from her (almost) eponymous blog to PopSugar late last year. Goodson doesn't pause when asked for the first word that pops into her head when a reporter names several stars: Britney Spears? "Yikes." Owen Wilson? "Goofy." Rachel Bilson? "Adorable. She's one of my favorites. Would someone please give her a job?" She's clear that hobnobbing with the rich and famous isn't her goal. While celebrity bloggers like Perez Hilton are becoming as well known as the stars they cover, Goodson says that route isn't for her. She likes watching the churning celeb world from her vantage point just fine. "I think the celebrities who get the most media attention are the ones who want it. They call the paparazzi before they leave the house because they don't want to do anything if no one is watching," Goodson said. "But other celebrities are still very, very famous, but manage to live their lives. It's an interesting give and take."